Rediff.com » News » Have you switched off your book? Have you switched off your book? This is the kind of question that you may be asking your daughter a few years from now. Since you are reading this column on Rediff, presumably on your computer, you are already someone used to reading on the screen and not necessarily on a page. But so far it has been news, messages and even articles. But soon it will be books. When that happens do we begin to see the end of one of the most enduring and loved products of all time, the printed, hand-held book? These questions are being debated today with the growing popularity of the Kindle, the e-book reader by Amazon. Kindle was introduced to the Indian market in October, but except for the 'early adapters', a term used for geeks or technology enthusiasts who have to try everything new straightaway, the e-book is nowhere as yet like a cellphone, ubiquitous and indispensable. Kindle is not the only product either. Sony and one or two major brand names are starting to produce similar devices. It is early days as yet, but have we not seen how fast technology spreads and how what was once regarded as exotic or expensive becomes almost a necessity, affordable or not? For sure, it will take some more years for this to happen with e-books, but whether you like it or not, it is bound to spread. The printed book, as we know it has been around for more than five hundred years, approximately since the Gutenberg press in 1450. We in India should know that the message is not the same as the medium, that content is different and precedes the communication device. Don't we believe that our ancient texts, say, the Upanishads were preserved for centuries in an oral tradition, transmitted as smriti, as memory, and are even regarded as apaurasheya, not ascribable to an individual. No known author, and no copyrights held. Then came the palm leaf texts for centuries and only much later the arrival of paper in India in the 12th century. Thus, the Mahabharata was out there, in pure ether, before being seen in a book. But notwithstanding this, what made you and me, know the story of the Mahabharata was a book, in one form or the other, even if it was only in a Amar Chitra Katha comic. The book is a much used, held, thumbed and loved product. Many of us may now read the news on the internet but still allude to the joy of holding a newspaper in one's hands: its bold screaming headlines, the rustle of its sheets, the task of turning it neatly, the bundle waiting for the kabadiwala -- all this has sensory pleasures and associations which are distinctive and different from that of reading an e-paper. How much of it is just the memory and how much of it is innate is difficult to tell. But we can already envisage the next generation growing without the good old printed newspaper, seeing only the screen version. With books it is different. Or so it seemed till now. It is not difficult to deconstruct the appeal of this product and Jeff Bezos, the CEO of Amazon, who developed the Kindle e-reader actually spent a long time reflecting on why people love books! Like its simplicity and portability: it can be hand-held, read in a chair, in the bed, at a beach, does not break or bend, is not easily destroyed unless you leave it in the rain, can be stored and retrieved, lent or borrowed at will; you can go back and savour or decipher a passage that you liked in a novel or go to the end and see 'Who the killer is' and spoil for yourself a mystery. If such are the physical qualities that someone like Bezos trying to remodel the 'product' thinks about, what about the more intangible pleasures that any book lover knows? The feeling of, expectation and intimacy with only you and your new book, in a secluded corner? As you settle down in your favorite chair or position on the bed with let us say, speculating ahead, Vikram Seth's A Suitable Girl for which you have been waiting for twenty years now: as you slowly open the jacket, read the dedication with curiosity, admire a handsome, even if balding Vikram Seth on the back cover, and tenderly open the pages. It is like the beginning of a love affair, if you are a Vikram Seth fan like me. The crisp white pages, the easy and enchanting prose, a whole new universe of fascinating characters and soon you are lost in the subtle pleasures of a book. Or the other sentiments: The turning of pages with satisfaction or impatience, the feeling of accomplishment that you are half way through the book, the satisfaction of having reached 'the end' and putting the book aside on the bedside table. Going even further, there is enough research today to show that 'reading' a book is a more creative and productive activity compared to 'seeing' its movie version. This is not mere snobbery. Seeing, whether television or a movie is a relatively passive activity in which the moving image grabs you giving little time for pause, reflection or interpretation. It is moving inexorably forward, even a Satyajit Ray movie, and the thinking comes later. But with a book, it is a more interactive process: you can stop and reflect, go back a para or a page and ponder, lose the immediacy but not the memory as you analyse it. In short, start a cognitive process that is different from that of seeing and hearing. A 'pause' on the DVD player is not the same as the pause in your reading of John Le Carre to work out the meaning of all that you have read so far. Can an e-book create the same magic, replicate the same process, if it can be switched on and off? 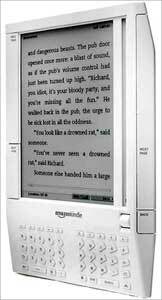 I hear that most of the experience is being retained and recreated in an e-book like the Kindle. I must add that although my notion of a book is a romanticised version of a favourite novel, books are also text-books, guides, reference manuals, and going beyond what a e-reader provides are not only books, but magazines, newspapers, in short everything that is available in ink, but now on e-ink. So with an e-book, the size and weight of your average paperback, (see the picture here) you don't have just one book, you have a whole library that you have paid for, to be carried in your coat packet. How is it done? A little bit of technology has to be mentioned at this point. Research shows that people do not want to read a book on the screen like a monitor with its back light and brightness. The requirement then was to create what seemed like a page with ink on it, but without permanent ink. The technological answer developed in the MIT is the e-ink on a special surface called Vizplex, a kind of electronic paper. The technological innovation is different from that of the text on the computer screen and has been aimed at creating a device as close to a real book as possible. What happens in the process is that you order your book, say the 900 pages of War and Peace. It is downloaded onto the device in sixty seconds, to be stored there forever and to be read page by page when you want it. Also, the newspapers, magazines or journals that you subscribe for. Is all this relevant for us in India? It is too early to tell. Besides its expense, there is also the need for fast and reliable broadband connection and the need for an operator to provide the service. It is an interesting aspect of both the shortening time span in technology adoption and the growing sophistication of the Indian consumer that the technology and the device are already available. Looking ahead, think of all the school children saddled with books, voracious readers with huge appetites for current best sellers and so on, and you can see the potential one day in India. For now, there are questions of affordability, the much cheaper costs of books in India, and the pirated books on the pavement at a fraction of the normal price, always a temptation. As I write about e-books, I hear a familiar complaint. "But I like books, the way they are." I can only add: me too. But it is like saying that I like walking and do not need a car. But sometimes I do, for going far or fast. And whether I like it or not, motorised transport is a reality. So will be e-books. Where have real friends gone?